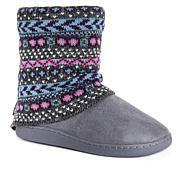 Whimsical patterns and pom pom trim makes these slippers irresistible. Kick off your shoes and show your feet some love, day or night. I LOVE THESE--I do not want to take them off...they are so comfortable! so warm! I do not even need to wear socks with them... these are the best house shoes I have ever had--and nice soles too, so you can go out and sit on the patio or covered porch. I JUST REALLY LOVE THESE!!!! Love these for cold temp times:both colors are great. Gave the plain color to my Michigan daughter who also loved the warmth and comfort of these slipper booties. I love a bootie slipper. These fit great and are warm and comfortable. They appear to be made well. I went back and got another pair!